Well I had a chance to take a business trip to Denver, so I jumped at the opportunity and visited a few joints to post about. I know it's way way way off Colorado Blvd, but it's my blog dammit. 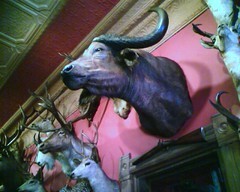 If in Denver, one should definitely make an outing to Buckhorn Exchange - the oldest restaurant in Denver. Their liquor license number is "1" - and posted on the bar wall - and they market the hell out of that. 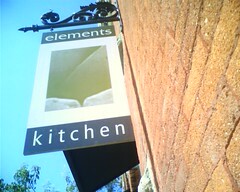 The restaurant is very touristy, old, and kitchy. 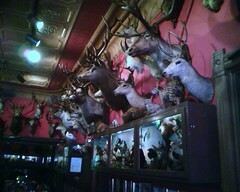 The first thing that slaps you in the face is all the trophy heads that adorn the dining and bar walls - something like over 500 various animals. 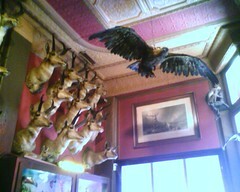 So, I wouldn't recommend this place to anyone who would be squeamish to dine while being eyed by dead animal heads on the walls. 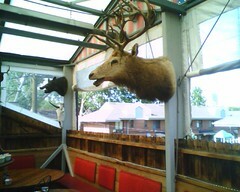 You may just be seated right underneath a few buffalo heads as I was on my visit. Many celebrities and politicians have eaten here over the last hundreds of years and you'll find all sorts of letters, pictures, drawings..etc. all over the wall. Basically all their history and documentation are on the walls. You can spend hours walking around and looking at that stuff. I didn't have a reservation so I went before supper hour and went to the upstairs bar straightaway while waiting for a table. It was Happy Hour!! I had me a Buffalo Bill Cocktail - which they claim is one of the oldest concoctions that the bar has served since the 1800s. 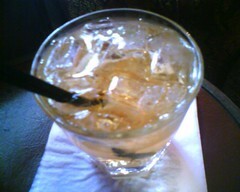 Its whiskey and apple juice - and on that hot humid day - it was very refreshing. This place specializes in various game meats, so I was looking forward to eating something out of the ordinary. 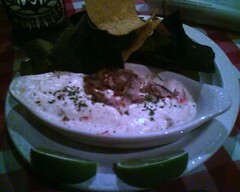 For an appetizer I tried out the Rattlesnake that's marinated in red chile/lime with chipolte pepper cream cheese. The rattlesnake had the consistensy of the meatier pieces of say cha shu pork - but with the cream cheese thing - it was a heavy glorified dip. I ended up just fishing out as much rattlesnake that I could find. Unfortunately, I was there by myself so I couldn't really sample other stuff like fried alligator tails, smoked buffalo sausage, rocky mountain oysters...etc. I'd recommend coming here with a group so you can try a bunch of appetizers. 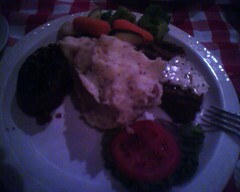 For a main dish, I did a medallion duo of Elk and Buffalo with garlic mashed potato and veggies. Sorry, the room was dark. 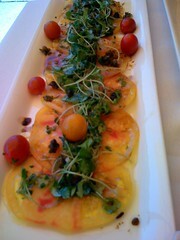 The Buffalo tasted like beef - more like a chunky ground beef - and was served with a garlic herb butter sauce. The Elk had a texture of gamey seared tuna, and they served it with some blueberry sauce. The sauce masked any hint of grass or cedar that was supposed to be there. 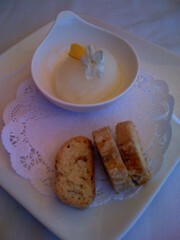 Additional Notes: There is a Light Rail stop right across the street from the restaurant. 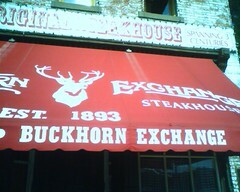 I found it convenient to get to Buckhorn Exchange from where I was staying. 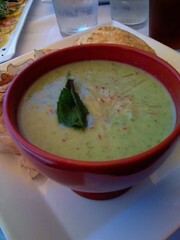 And they do have patio dining as well. 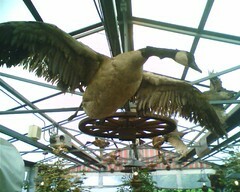 Here are some pics.